Nailart Creations: The Ultimate Nailtag! 1. When did your nail passion start? It started about three years ago, I was bored with only one colour of nailpolish, so I decided to do something on my nails. After that one I googled and saw a lot of beautiful nailarts! I made every week another nailart on my nails! 2.When did you start growing your nails long? When I was little I bit my nails, but when I found out nailart I quit biting, and since then my nails grow longer! Now I've got shorter nails because I broke one nail yesterday..
3.What are the secrets to growing long natural nails? My secret is always using nailpolish! When I don't wear nailpolish I break my nails..
4.Do you like long or short nails? I like long nails, but not to long. I've had my nails a while very long and unequel, now I'm more happy with an average length! I really don't like pictures of nailbiters, it looks so horrifing how anyone can eat their whole nails..
5.Which do you prefer most acrylic,gel, fiberglass or any other nail enhancement? Don't have any idea! I've always got my real natural nails! 6.Do you prefer false nails or natural nails? 7.What nail shape do you like best,round,square,pointy,squoval? 8.What nail polish brand do you love the most? I think I would pick China Glaze, I love this brand! But don't think other brands are bad ;) I like almost every brand nailpolish. 9.If you were stuck on an island what would be the 3 nail items you would bring? Definitely a nailfile, my favorite nailpolish (aitsj that's a hard one, I've got almost every week another favorite :O!) and some cream for my hand and nails. 10.Why do you love nail art? and How did you get started doing nail art? Nailart is my way of expressing myself. I really love to try everything that I made up on my nails, or if I see something awesome which I want to try for myself. My obsessing started three years ago on a boring sunday. I thought my nails were boring with one colour, so I thought it would nice to do something on it. 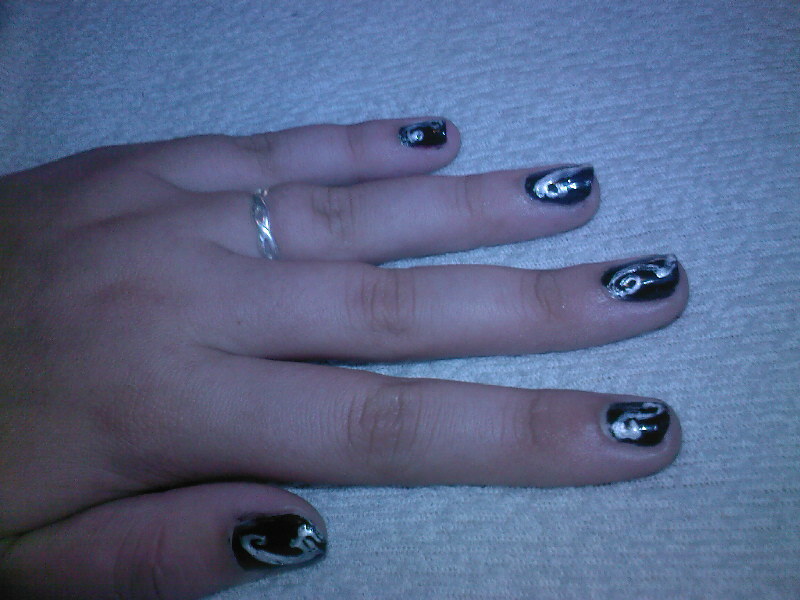 You would definitely laugh about this, but I found my very first attempt for nailart! (I was 14 years old when I made this, how cute!). Nice to know a bit more about you! I'll try to do this tag once I get a bit more caught up with my swatching. Leuke tag ! Ik ga hem denk ik wel even van je overnemen, alleen dat moet wachten tot ik mijn geschiedenis herkansing heb gehad haha. Ik vond het leuk om te lezen, en nu weer lekker leren !